Chuck Krafft, a Lansing-area writer, covered Tuesday night’s Class C quarterfinal at Owosso on his blog, the Bleacher Denizen. I saw the carnage firsthand as well, but I think the game’s final minute deserves a full-fledged rehash. P-W misses a three point shot from the wing. Kyle Nurenberg grabs the offensive rebound, but P-W misses another three point shot. Adam Wesley races back on defense to stop Beecher from scoring an easy layup … Quay Burks inbounds the ball to Tommie Johnson for a layup that gives Beecher a 38-31 lead. Adam Wesley hits a three point shot from the wing to cut the Beecher lead to 38-34 with 53.6 seconds left and stop a Beecher ten point late game run. Beecher is fouled and misses the front end of a one and one opportunity. P-W grabs the rebound, but throws a long pass out of bounds. Quay Burks is fouled and hits both ends of his one and one opportunity to push the Beecher lead to 40-34 with 36.6 seconds left. … Spitzley swishes one, two and three free throws to cut the lead to 40-37 with 27.6 seconds left. Quay Burks is fouled and sinks one of two free throws for Beecher with 25.3 seconds left to give Beecher a 41-37 lead. Kyle Nurenberg turns, jumps and rattles in a three point shot for P-W to cut the lead to 41-40. Before I can even finish my note, Nick Spitzley steals the ball and puts it in the hoop to give P-W a 42-41 lead with 4.1 seconds left in the game. Beecher is only able to heave the ball from half court as the buzzer sounds. Plenty of P-W fans actually missed what may have been the most improbable comeback they’ll ever see at any level. If I hadn’t been interested in the game’s final stats, truth be told, I’d have been in the parking lot with them. I think it’s worth pointing out that when Spitzley was fouled on the 3-point attempt, Beecher actually had fouls to give. That’s just another one in a long line of variables that had to go right for P-W and wrong for Beecher to effect this outcome. On the bright side for Beecher, the Bucs are among the youngest teams I’ve seen playing in the quarterfinals at any level. Williams returns the vast majority of his roster including Quay Burks and Malik Ellison, two high-impact underclassmen. I’d bet the farm on the Bucs getting back to the Breslin where they belong. 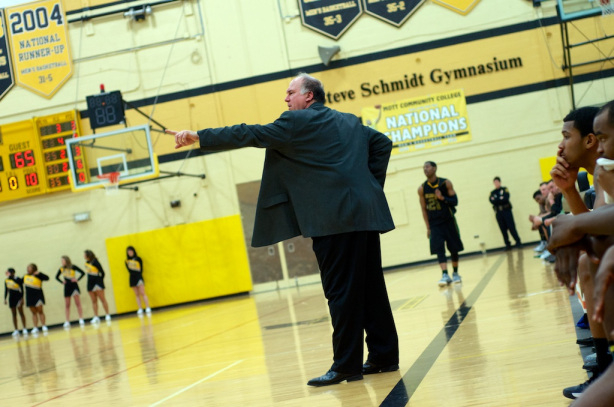 Mott’s Steve Schmidt coached his program to its 19th consecutive 25-win season on Tuesday night. 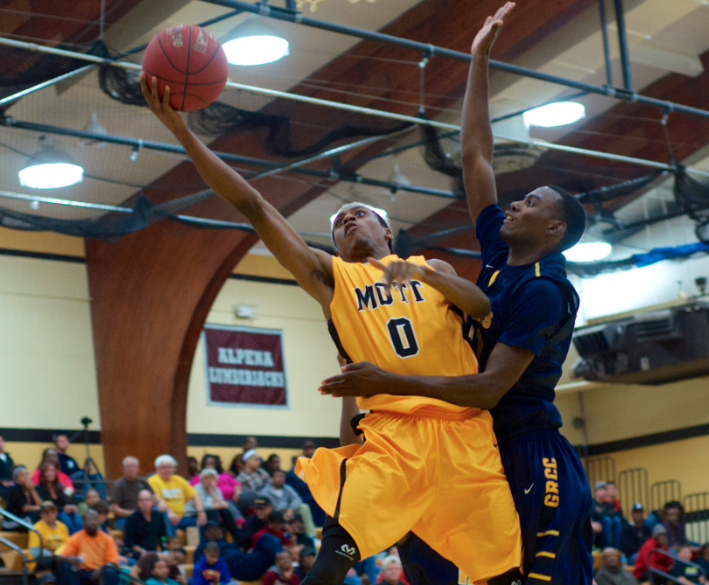 FLINT, Michigan — Mott’s opening game in the District 10 Tournament on Tuesday night seemed eerily familiar. The no. 5-ranked Bears punished Schoolcraft by 46 points at home just two weeks ago and, lo and behold, their first round opponent came back for more. 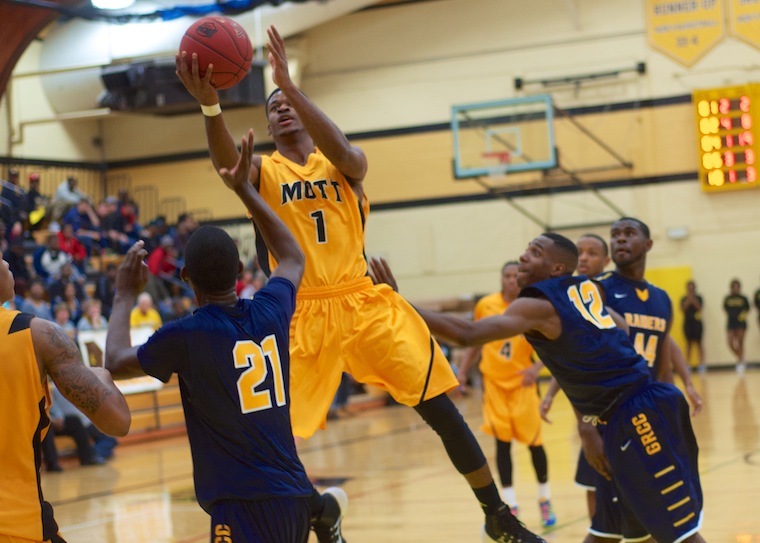 Mott punished Schoolcraft 105-55 and will compete in the semifinals against rival Oakland CC at 5:30 p.m. on Thursday at Delta College. The victory, the Bears’ sixth in a row, marks the 19th consecutive season that head coach Steve Schmidt has led Mott to at least 25 wins. That’s not a misprint. It’s a statistic that is every bit as absurd as it is true. It speaks to the degree of dominance he has asserted in his career over junior college basketball. He has made a career out of making good teams look average and average teams look like Schoolcraft did tonight.